It is rare to come across a narrow home built on a plot just 6.5 meters wide. So it's with great pleasure that we present La Casa Desnuda, a Mexican home with a very special spirit. This stunning industrial-style home might only be 6.5 meters wide, but it is 27.5 meters long and rises to cover a full 150 meters of floor space over three levels. Narrow homes always run the danger of feeling pokey, but that is hardly an issue here. The unusual shape has been skilfully utilised to create a home with soaring grace. Stunning tall glass doors lead to the back garden, the walls and floors are replete in natural materials, and the interior is surprisingly bright. There is even an interesting internal courtyard in the bedroom. A deep lap pool is the perfect choice for a narrow allotment. In this home, the depth of the pool subtly highlights the strong vertical lines in the exterior. The outdoor pool, together with lush green foliage at two levels also adds to the surprisingly abundant feel of the home. But it's the double-height floor-to-ceiling glass doors that really have our attention. Narrow homes are often dark because they lack side windows. But this large glass opening allows lots of light to penetrate the interior. 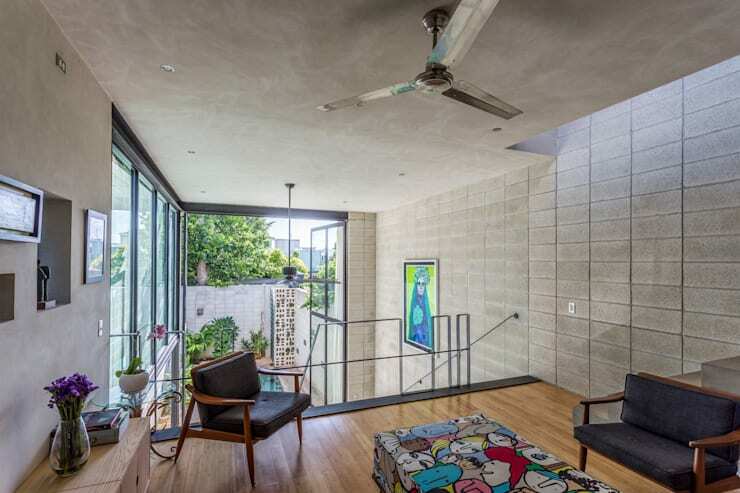 Note how the walls are made from unpolished concrete. As we will see in a moment, the home is replete in raw materials that further emphasise the connection with the outdoor elements. If we move up a level and rotate around, we come to a natural entrance area. 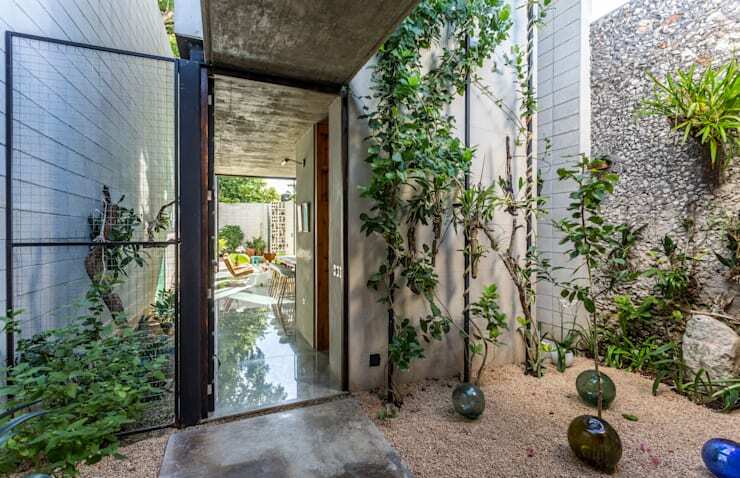 The entrance has an internal garden that opens the home up to the natural elements. We will see this feature throughout the abode through a series of narrow portals or openings in the ceiling. These don't just make the home feel bright and airy, they also add that all-important light to the interior spaces and walkways. See how the tall garden foliage further emphasizes the soaring, vertical design of the home. The raw materials so prevalent throughout this home work very well in the kitchen. 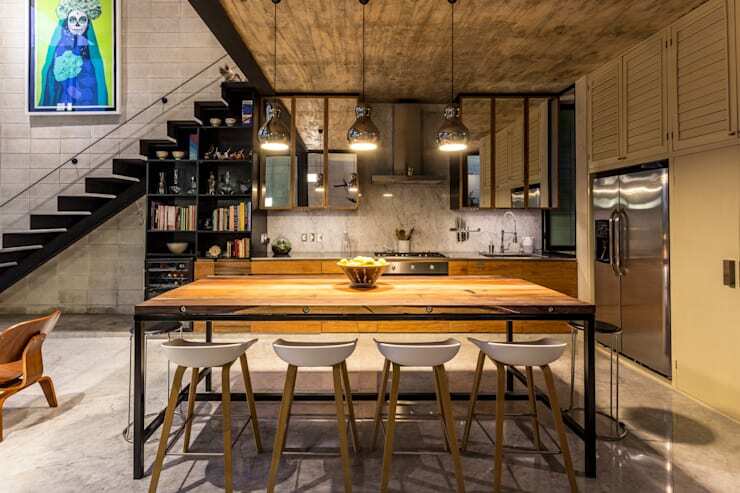 The natural variations and textures in the raw concrete and golden wooden materials add an easy warmth to the space. The problem of light has been addressed in an innovative way as well. Mirrored kitchen cabinets reflect precious light and add a little extra gloss to the kitchen decor. The metallic look is further emphasized with silver pendant lights and aluminium kitchen appliances. The bedroom is perhaps our favourite level. 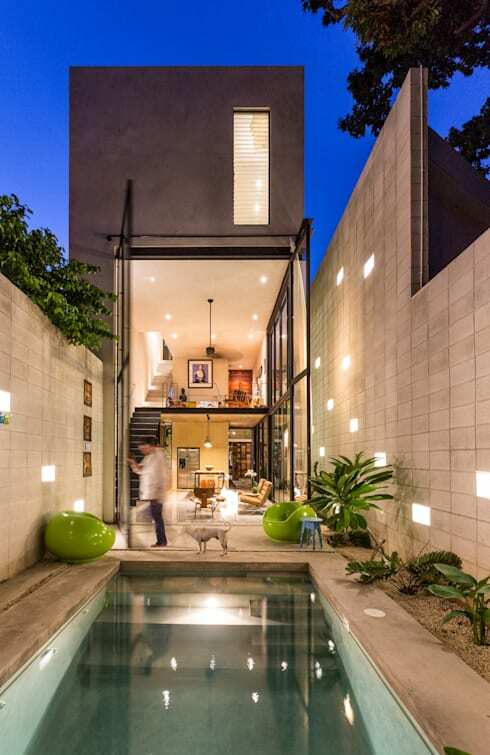 It has a wonderful internal courtyard that offers almost complete privacy. The courtyard is enclosed on three sides by glass and creates a very green, natural ambience in the bedroom. Note how the courtyard has a fourth wall made from concrete bricks that offer a good balance of privacy and light. Finally, no Mexican home is complete without some bright and lively artworks. 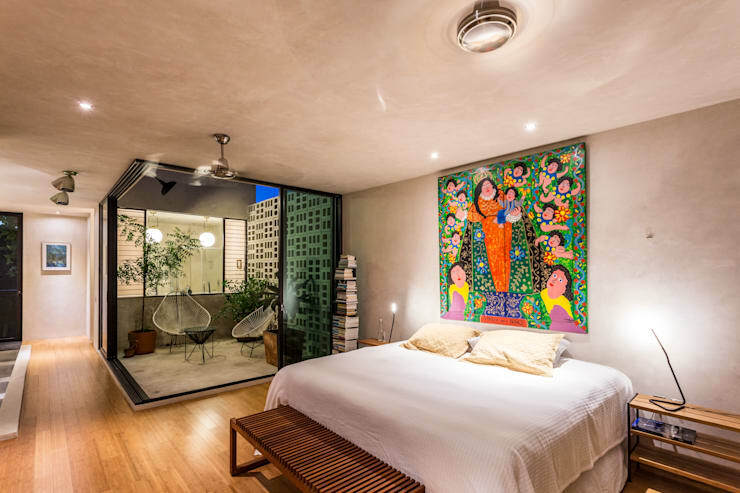 The artwork above the bed is certainly an eye-catching piece. If this project has got you interested in the potential for creating connections between internal and exterior spaces in your home, you'll love A modern home of eclectic charm.